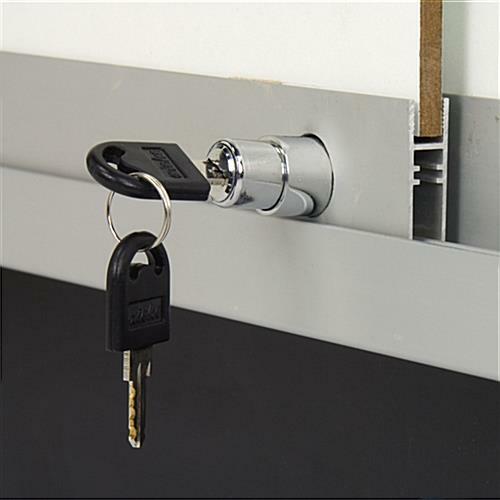 Locking doors keep merchandise safe from theft or damage! Unassembled shipping saves you money on warehouse assembly and shipping costs! 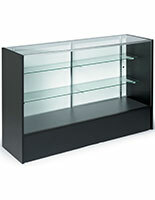 Tempered glass design is more durable than traditional glass cabinet displays! 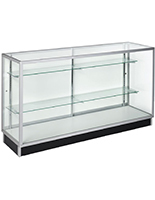 A glass cabinet provides an accessible and convenient area to store and showcase retail merchandise. This glass cabinet is a 5' long case, perfect for jewelry, perfume, collectibles, electronics, or anything else you have to show. 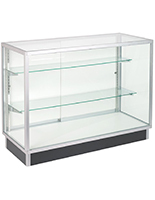 This glass cabinet, also known as a display case, has a lot of great features to make it the perfect choice for your glass display needs. The cabinet features two adjustable-height shelves (one 10" deep, one 12" deep). 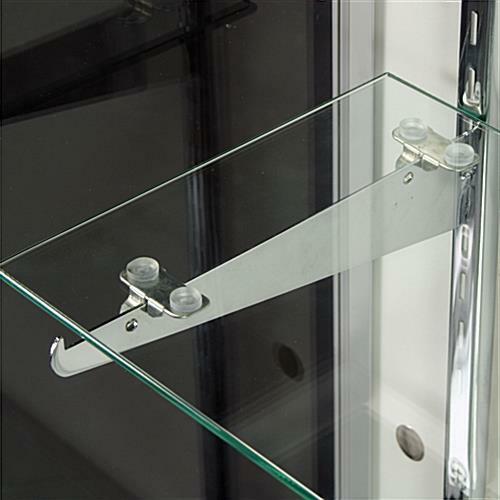 Adjustable shelves are very convenient when changing your product line or rearranging your glass cabinet for promotions or seasonal displays in commercial environments. 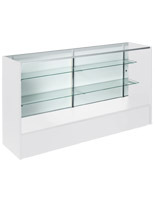 The glass cabinet features 29" of vertical space in which to affix the two shelves. 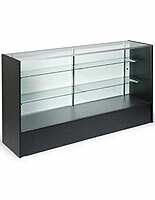 The display case, glass cabinet measures 60" wide by 38"h (standard retail counter height), by 20" deep. A 4" high kick plate protects your cabinet from foot traffic damages. 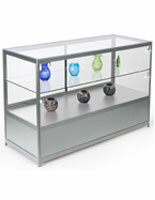 All glass surfaces of the cabinet are constructed from tempered glass. 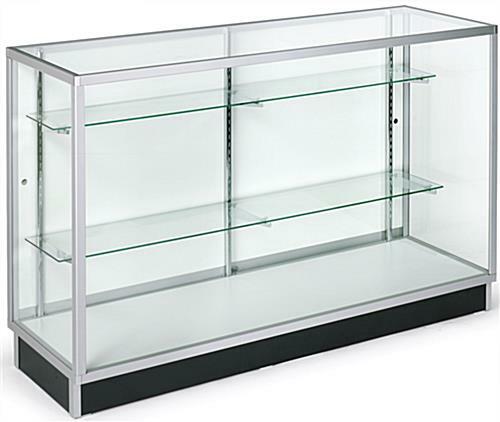 A tempered glass display cabinet is a much safer choice for busy retail environments than traditional annealed glass cabinet. The cabinet is less apt to break in busy environments, and if it does, it will break into small, manageable pieces, rather than large, dangerous shards. Clear-coated aluminum extrusions add a classy touch, while providing more stability than plastic extrusions. Sliding doors allow easy access to displayed items, while a plunger lock ensures only authorized persons may have access to the cabinet. 60.0" x 38.0" x 17.5"